Brushing your teeth as part of your morning and evening rituals plays an important role in oral hygiene. It helps you maintain good oral health by removing food particles, debris and plaque from your teeth and bacteria from your mouth. Good oral health also impacts your overall health. It helps prevent respiratory diseases, reduce the risk of heart disease and stroke, improve cognitive functioning and prevent stomach disorders. 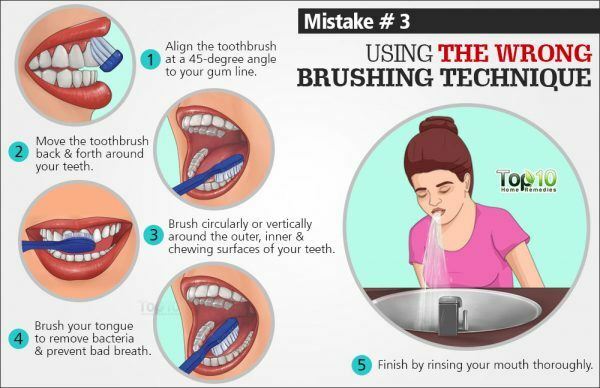 Although tooth brushing is a common task, many of us do not do it correctly. There are many common mistakes that we all commit. To maintain good oral health, you must be aware of these mistakes and avoid them. 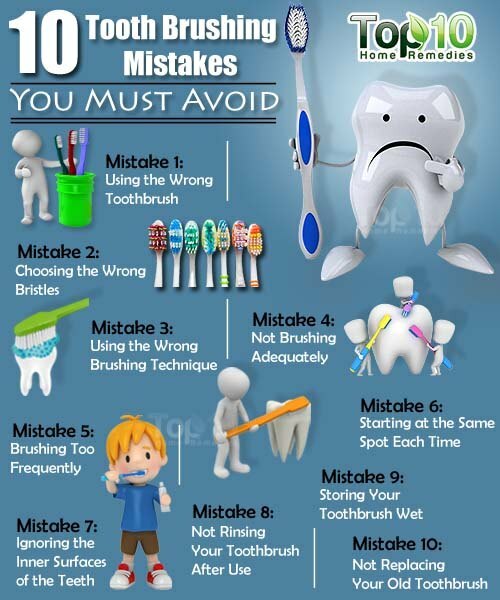 Here are the top 10 tooth brushing mistakes that you must avoid. Toothbrushes come in different sizes, and most people do not know which size to purchase and often do not give it any thought. To clean your teeth correctly, you need to use a properly sized toothbrush. If it’s too big, you may have to strain your mouth to keep it open. If it is too small, then proper cleaning will not be possible. When a toothbrush feels good in your hand and mouth and reaches every tooth, then it is the right size. You can buy a manual or an electronic toothbrush, whichever you prefer. People who have arthritis or pain in their hands, arms or shoulders may find that an electronic toothbrush is a good option. Just like there are different sizes of toothbrushes, they are also made with different bristles. They may have straight, round, angled or zigzag bristles. Dentists say that angled bristles are generally the best, as they help clean all the teeth properly irrespective of their position. Along with the pattern, you need to consider the quality of the bristles. Avoid using a brush with hard and stiff bristles that can erode your dental enamel, irritate your gums and cause recession. Always use a soft-to medium-bristled toothbrush. Align the toothbrush at a 45-degree angle to your gum line. Using short, gentle strokes, move the toothbrush back and forth around your teeth. Then brush circularly or vertically around the outer, inner and chewing surfaces of all your teeth. When done, brush your tongue to remove bacteria and prevent bad breath. Finish by rinsing your mouth thoroughly. By following this guideline, you can keep your teeth clea, remove plaque, prevent cavities and get rid of bacteria in your mouth. For overall oral health, the American Dental Association recommends brushing your teeth at least twice a day and preferably three times. You must brush in the morning, before going to bed and, if needed, after eating a meal. This will help remove plaque and neutralize the pH of your mouth, keeping your teeth clean and healthy. You must also brush for 2 minutes, but most people do not follow this routine. To ensure you are spending the required time brushing, divide your teeth into four sections: top left, top right, bottom left and bottom right. While brushing, spend 30 seconds in each section. Some people are overly hygiene-conscious and end up brushing their teeth too frequently. If you brush more than 3 times a day, it can harm your teeth. It can lead to recession of the gum line as well as hastened erosion of dental enamel. So, it is advisable not to overdo it. The trick to good oral health is to brush gently for 2 minutes, 2 or 3 times a day. Most of us start brushing our teeth at the same spot. It’s a common mistake. When we start at a particular point every time we pick up a toothbrush, there is a high chance of getting lazy once we reach the last quadrant of our teeth. This means proper cleaning is not done. To clean your teeth thoroughly, dentists recommend to start brushing in a different place each time. This way, all your teeth will get equal time and cleaning. While brushing our teeth in the busy morning time, our minds might be preoccupied and we can forget to brush our teeth’s inner surfaces. Such a mistake can lead to a buildup of plaque on the inner surfaces. This can be just as damaging as the plaque on the front of your teeth. When brushing, do not focus only on the front of your teeth because it’s the side that is most visible. 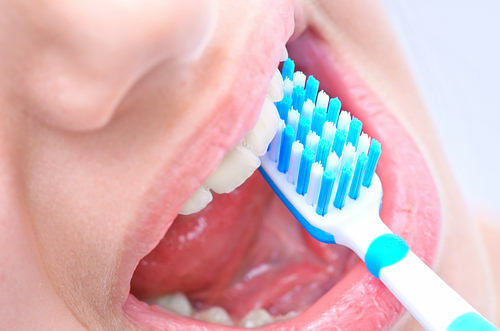 You must also brush the inner surfaces of all your teeth to maintain good oral health. 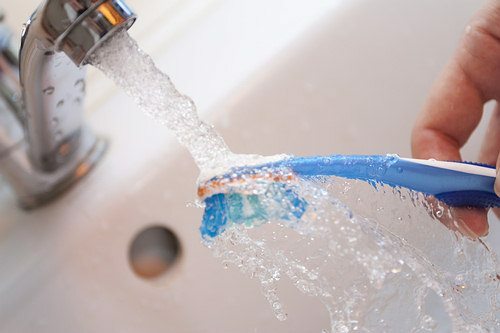 In our rush to get out of the house in the morning or off to bed at night, we often don’t take time to rinse our toothbrush properly after using it. Due to this, bacteria and food debris remain on the bristles, which may cause infection and gum disease later on. Plus, it may cause the bristles on the brush to become hard. To prevent reintroducing bacteria and other germs into your mouth the next time you brush, rinse your toothbrush thoroughly after each use. It is best to hold the toothbrush under running tap water for 1 minute and then allow it to air dry. This will help remove any leftover toothpaste, bacteria and food particles. Perhaps you are already vigilant about rinsing your toothbrush after each use, but do you put it away in the bathroom cabinet when it is still wet? A damp toothbrush becomes a breeding ground for bacteria, and the next time you use it, you are unknowingly introducing bacteria into your mouth, which can cause bad breath and other gum diseases. 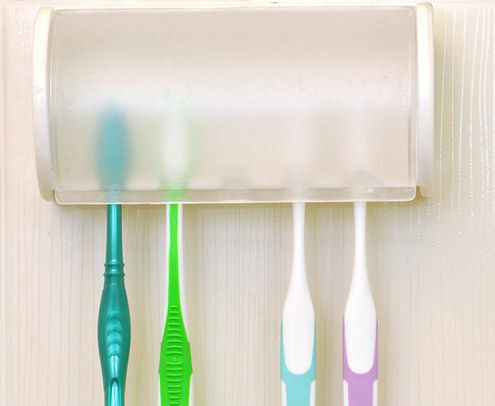 To rectify this mistake, after rinsing your toothbrush, shake off the extra moisture and store it in a brush holder with a cap that allows air in. You can even dry out your toothbrush in the sun for a few minutes. Plus, you can keep two toothbrushes handy, so that one is always dry. Many of us use a toothbrush as long as we can. But this is a big mistake that you must avoid. After using a toothbrush for a few months, the bristles start bending and become frayed. A toothbrush in this condition will not clean your teeth properly. Dental experts recommend replacing a toothbrush every 3 to 4 months. Take a close look at your brush regularly and make sure the bristles are flexible and straight. 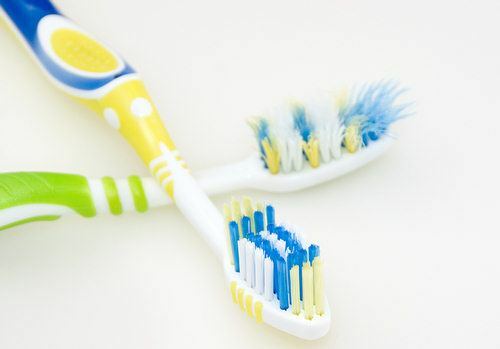 If the bristles look frayed, change your toothbrush immediately. 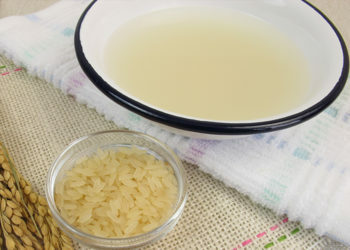 Try something that has been used for thousands of years and I believe is still the best…coconut oil being swished around in your mouth for several minutes. This gets right in between all your teeth and cleans the surfaces when used regularly. It’s really important to spit out all the debris it loosens and to rinse fully afterwards. Best tip you’ll ever get for clean teeth.